*Note: It may work for other versions as well. I have only tested on my own machine. 3. Run the extracted .exe and a window will pop up, click proceed. 6. Using the MusicBee bottle, browse to where the MusicBee application is installed, which for default should be located in "users->crossover->desktop->MusicBee->MusicBee.exe"
7. To make your life easier, press "save command to programs menu"
Here is a picture of it running on my mac. Wonderful! Thanks for the tip. How does MB work on that environment as compared with PC? Fast enough? Any limitations or shortcomings? What was the error message popped up? So far in my testing, it has been pretty stable and fast. There are some graphical issues (the color seems to be off) but its nothing a skin wouldn't fix. I have only tested a few functionality and they seem to be working fine. The error that came up was for the .net framework. I'm not sure what it meant, but all seems to be fine. Thanks for the replies. Sounds good. I'd appreciate if you keep it updated for current and future Mac users. I've added this to the FAQ page on the wiki, in addition to the other guide. This looks like a great way to have the Bee fly on a Mac. Any additional news or insights after your last post? Do you still use it? Thanks a lot in advance for a quick update. I've tried doing this. 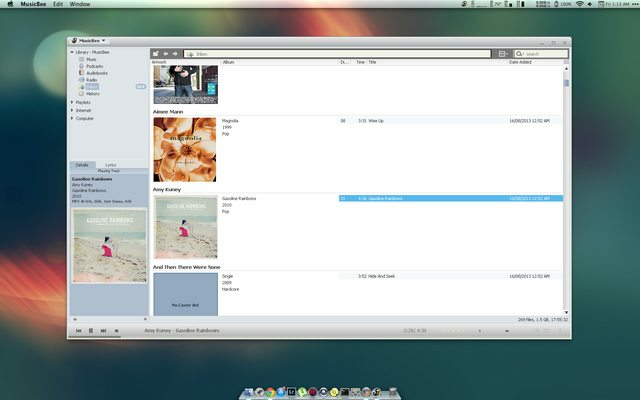 I can get Musicbee to run, but it lacks the functionality that really makes Musicbee sing on Windows. The tagging can be done by editing it yourself, but you can't use the great added plug-in tagging look-up features within Musicbee. You also can't transcode or convert files from a flac to a mp3 or etc.. If I could get it to do those things it would be AMAZING, but alas. The only other thing would be to export to an Itunes playlist so you could then load it onto an ipod or something. So, I just have to find other solutions like the crappy manager which is slow and bloated Itunes, that won't even recognize or play flac files. If anyone finds other solutions, please post them. I'm waiting with bated breath. Actually, using the latest version of CrossOver, you don't need to do anything other than to "Install new application", and type MusicBee. Just a note that MusicBee 3.0 does not work with Crossover as MB does not support XP anymore. I managed to install MB 2.5. However, MB dies not see the Mac folders and drives. How can I make it see these so it can scan the music library?